b) I am, as one reader told me, “about one step removed from the Pharisees who were angry at the disciples for plucking the grains of wheat on the Sabbath”. Ahem. Last things first. Let’s stop with the euphemisms and with the attempt to pretend that show up at somebody’s door with a fake name and a fake purpose is anything but lying. Trying to euphemize it by some other name is exactly like trying to euphemize torture as “enhanced interrogation” or abortion as “tissue extraction”. When even the *defenders* of Live Action call it lying (as my friend Peter Kreeft did), it’s lying. That said, let’s make another distinction: plucking grain and eating it on the Sabbath is not intrinsically evil. Lying is. I’m perfectly aware of what the intention is: stopping abortion. And I applaud the intention. But lying is still lying. Now, I am perfectly aware that lying, while intrinsically immoral, is not always a grave sin. All sorts of things enter in. There are lies that are fibs. There is the matter of freedom and understanding and culpability. I get all that. And I get that the goal is a noble: hasten the day when salt is sowed on the ground where the last Planned Parenthood clinic has been razed and abortion is a thing of the past. I fully support that goal and praise Live Action for desiring to achieve it. But here’s the problem: All sin consists of the attempt to achieve some good end by disordered means: and attempting to establish truth by lying is profoundly disordered and will only end in mischief and damage to the faith to the prolife cause. So I think that before the discussion get too abstract it’s important to ask what real good is even being accomplished by Live Action’s lies. People immediately rush to the Nazis at the Door Scenario and fall into the delusion that lives are being saved by Live Action lies to Planned Parenthood employees. Understand this: not one. single. life has been saved by Live Action’s lies. Not a single abortion has been prevented. All that happened is that PP is temporarily embarrassed and prolifers get a thrill for a day or two. After that, PP fights back and says “Those videos were edited and LA is lying.” And right there is the problem: because Live Action has openly acknowledged that they *were* lying about their identity and purpose. So Planned Parenthood then appeals to people on the fence about abortion and says, “Why should you trust self-confessed liars?” And their supporters, who might include some future Bernard Nathanson or other troubled conscience, look at the spectacle and join the herd in the comboxes denouncing Christians as liars–a hard point to argue when they are in fact lying. Indeed, while Christians desperately want to tell themselves that Live Action’s “stings” have been devastating to Planned Parenthood, the reality is that flagscows of the Left like the Nation are *exulting* in Live Action’s tactics and celebrating “the genius of Cecile Richards” for taking this gold-engraved opportunity to shout “Look! Christianist liars are persecuting Planned Parenthood!” and driving donations way up. Saying “They were going to do it anyway” is morally insane. Saying “We must do evil that good may come of it” is morally insane. Indeed, even arguing that good has come of it is morally insane. Because at the end of the day, all we really have is some video footage which is being argued about by two groups of people who are documentably liars–and in this particular case, only one of those group specifically confessed to lying in order to make the video. People who think this is going to persuade fence sitter or persuade anybody outside the zealously prolife camp have simply lost touch with reality. People who think that a Christian message about the gospel as the Truth can be founded on lies are insane. And that’s the most insane part of this: in the end, this tactic leaves the Christian community burning itself up in the insane pursuit of justification for lying and tempting people to grave sin that produced not *one* good outcome (unless prolife schadenfreude [Gr harm joy] over a minor PP embarrassment is now Priority One for the prolife movement), while Planned Parenthood is enjoying increased funding from donors by sending out fundraising letters saying, “Christianist Prolifers are Lying about Us”. This is why I say consequentialism such as Lying for Jesus is a Faustian Bargain. You lose your soul and get *nothing* in return. Sorry, but Augustine, Aquinas and the Catechism are right. Lying is intrinsically immoral and fundamentally corrupting of human relationships. And before you try, yet again, to euphemize these lies as “acting” or “role playing” or “fiction”: no, this is not “acting” or “role playing” or “fiction”. Those speech acts involve the fundamental reality that the the audience is willingly and knowingly suspending disbelief and knows the actors are acting and the writer is telling a tale. This. was. *lying*. Christians are bloody fools to defend it. And, by the way, they would be fools to defende it even *if* it had worked. But that they are wasting breath defending it when it is not just wrong but destructive of the prolife cause is double folly. This entry was posted in Uncategorized, Words on July 21, 2015 by Bill. In the Commonwealth of Massachusetts, it’s a capital crime, it will get you the death penalty, to convey a death threat that results in a homicide—the civil equivalent of a mortal sin. But still, Guy B takes preemptive action, kills Guy A. Guy C, who didn’t have any direct hand in the homicide, is guilty of a captial offense in Massachusetts, he’s subject to the death penalty. What if Dr. Bernard Nathanson had been on the verge of ceasing to perform abortions. I have some new, exciting forum for showing the world what a terrible guy Dr. Bernard is—it’s nothing new, Dr. Nathanson hasn’t changed anything, it’s all about the art of persuasion except, I’m not acting to persuade him, the most important person, the principal in this situation. So I tempt Dr. Nathanson to perform some abortions, not really to prevent abortion, but to make some abstract point about the terrible abortionists. For a week, Dr. N. refrains from his intended course of repentance, but eventually he stops aborting. Am I guilty of part of the deaths of the perhaps hundreds of children he aborts during that week? In Catholic moral theology, I am guilty of mortal sin because another has committed mortal sin at my prompting. There’s nothing new about Dr. Nathanson’s activities, nor about the fact that everyone knows what’s going on: It’s a baby, smartie. It’s homicide against a pre-born person. What’s in danger of happening is that we so over-emphasize the art of persuasion (known in the ancient world as rhetoric), that we risk losing our focus on crucial issues in the domain of logic (dialectics). You can search Google for “selling baby parts” from the first day of this millenium (1/1/200) to the last day of June, 2015, before the recent controversy broke. Google no longer lists the number of hits, but it’s probably in the 100,000s, if not millions. This phenomenon has been known for decades by anyone who cared to be aware of it. 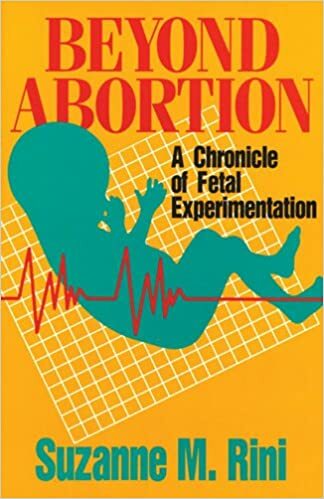 I own the book Beyond Abortion: A Chronicle of Fetal Experimentation by Suzanne M. Rini. It was published in 1993. It didn’t sell very well. Everyone who would be concerned, already knew this was going on. The big difference is that the young man (whom I know personally, he’s been to my house) found a new forum for presenting the information. So now we’re in the environment of Rodney King being beaten on camera by rogue cops. Can’t We All Just Get Along? This is a media issue. The Pill doesn’t prevent abortions, it feeds them. The Alan Guttmacher Institute proved this decades ago. It was enshrined into “law” in 1989 in PPFA v Casey. The Pill doesn’t work, it has a “method failure rate” of 9%, one pregnancy every 11 menstrual cycles, belief in its efficacy is one of the chief secular superstitions, it’s the engine of the sexual revolution, (“you say it like it’s a bad thing“), it enabled women to discover they don’t need men hence, it prompted a significant increase in divorce, vastly increasing the misery of already born children. Pro-life opinion in the US, now a majority but useless because “pro-life” women are going to go to abortion businesses when they’re under stress, isn’t going to increase, especially, we’re not going to persuade the elites of abortion’s disadvantages, until Evangelicals get on board with the official Catholic Church in pointing up how contraception is wrecking our society. We have allowed the selling baby parts brouhaha, in the domain of the art of persuasion, to divert us from logically focusing on what needs to be done to discourage abortion. In the process, we’ve forgotten, if we ever knew, that we don’t make progress by tempting the opposition to show its worst side. This entry was posted in Words on July 19, 2015 by Bill.